The world of location-independent entrepreneurs seems tiny, with only a few spots worthy of long-term stay. Bloggers rave about Chiang Mai and Medellín, Bali and Berlin, Ho Chi Minh City and maybe even Prague. But Gran Canaria? Where is that? Does it even exist? Welcome to the Canary Islands. Politically they are part of Spain, but geographically they form part of the African continent. Gran Canaria scores high in climate rankings, is relatively affordable and is already attracting digital nomads. Here are some good reasons for you to join them. The Canary Islands, though part of Europe, are at the same latitude as Florida and Western Sahara. With relatively cold ocean current, the temperatures stay bearable in summer (below 30°C/86°F), while the sun is powerful enough to heat winter days to 20°C (68°F) and above. Combined with little rain, this means you’d better pack your t-shirts and flip flops. 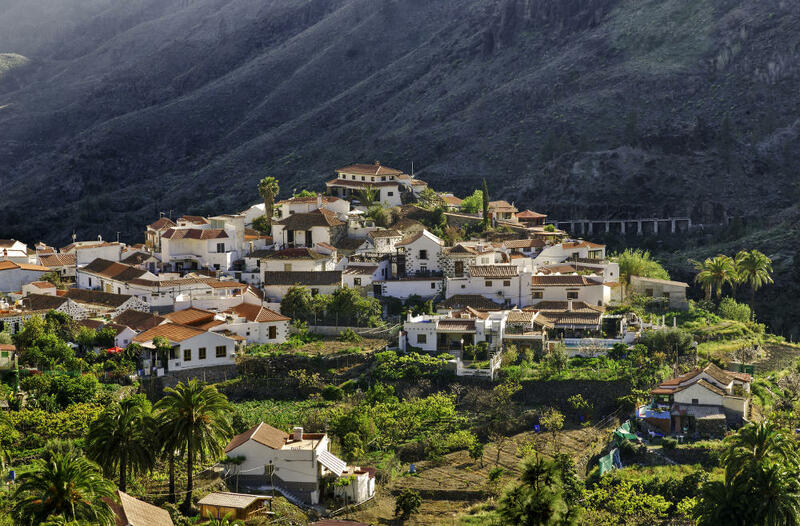 There’s no arguing about it: weather-wise, the Canary Islands are the best European place to hang your hat in winter. You’re not the only one to escape the short and cold days in the rest of the continent, though. Fortunately the sun-bereaved pensioners stick to the southern part of the island, which is where you won’t be staying. When I say you should make Gran Canaria your temporary base, I’m really referring to Las Palmas. The island’s capital is big enough to support shopping malls and offer things in the way of cultural events, but small enough to cycle around. In fact, in the past three years the city has seen a proliferation of bicycle lanes and pedestrian streets. Its natural setting on a peninsula jutting into the ocean means the beach is never far away. In fact, Playa de Las Canteras is considered Europe’s best city beach; it’s three kilometers long and protected by a natural reef. Nothing beats taking a seat on the boulevard, enjoying a pint of beer and watching the sun set over neighboring Tenerife. Balancing work and play better than anyone else – that’s what digital nomad life is all about. As for the work bit, you will find enough cafes with free (and fast) wifi, such as Café De Vita or Bar La Peregrina. If you’re looking for a quieter and more comfortable work space, try the coworking spaces that are popping up like mushrooms. CoWorKingC is wedged between the port and the beach, while La Fábrica is spitting distance from both Las Canteras and the city’s main shopping drag, Mesa y López. The “Cicer” area of Playa de las Canteras, down by the Auditorio, has no reef to protect it from the Atlantic Ocean. On most days, this means ample whitewash – just what beginning surfers need for learning to climb on a board. More experienced surfers will appreciate the waves along the north coast or at the city’s other beach, El Confital. If you’re new to the sport, sign up for a course. Competition between surf schools is fierce, meaning you can learn to surf cheaply. A five-day course (two hours of group lessons per day, including board and wetsuit hire) costs just € 80. When you’ve made it out here, it’s a good idea to check out one of Gran Canaria’s six island neighbors. Take a Naviera Armas or Fred Olsen ferry or jump aboard a Binter or Canary Fly propeller plane. Gran Canaria’s central location in the archipelago makes it a hub for interisland transport. Go to Lanzarote for its raw lava landscapes and idiosyncratic architecture, visit Fuerteventura for its deserted beaches or climb Spain’s highest mountain –El Teide reaches 3,718 meters or 12,198 feet– on Tenerife. The western islands of La Gomera, La Palma and El Hierro are covered in lush forests. Bring or buy a pair of walking shoes, because these islands’ ravines and craters are best explored on foot. Gran Canaria’s climate invites you to be outside, to be active. The air is clean so get those lungs working! Put in some one-kilometer laps at Parque Romero, enjoy year-round diving around La Isleta, try paragliding or escape the city bustle on one of the island’s mountain trails (hike or bike). The route to the volcanic outcrop of Roque Nublo from the carpark along the GC-600 is easy hike with panoramic views. On an island with a strong beach culture, gyms and yoga studios are everywhere. Hundreds of other nomdas can’t be wrong. Startup whizzkids, freelancers and remote employees are finding their way to Gran Canaria and tell their colleagues about it. I started a Facebook group for digital nomads who visit Gran Canaria which, at the time of writing this blogpost, has 350 members. The Surf Office and coworking space Nemesys 2.0 regularly organise digital nomad mixers and tech meetups. Join the Facebook group I mentioned to stay updated. Have you ever wondered what would happen if you didn’t tax alcohol? Then come to Gran Canaria. Although Las Palmas has its fair share of lounge bars and discos, the live music scene is more interesting. From cosy jazz-club Charleston to the beach promenade to the concert venue Paper Club, bands are everywhere and anywhere. Each February-March it’s carnival time on the island! This a perfect excuse to dress up and get wasted. Dance with sheiks, nurses, Sherlock Holmes and Fidel Castro while downing Tropicals or shots of the local honey rum. Your hangover cure? The ocean. Spaniards love to eat, and they love to take their time to do so. Lunch, taken around 2 PM, is the main dish, which often calls for a siesta afterwards. Dinnertime is around 10 PM, but don’t worry if you’re hungry way before that – restaurants in Las Palmas serve around the clock. Make sure you check your Foursquare app for the latest restaurant ratings. Okay, if you insist: here are some of my recommendations. If surfing made you hungry, go to Café Central for wraps, burgers and salads. La Bikina is a great port of call for vegetarian food. Do you fancy seafood or fish? La Marinera is an institution. For lip-smacking Andalusian dishes, head on over to one of the Allende branches in town. Japanese teppanyaki restaurant Sakura II is another one of my favorites. Hi André ! Thank you for this helpful post. I’ve been looking on the internet for a location with a warm and sunny climate, a lot of outdoor activities, in Europe (for Visa, etc) and with cheap flights : Gran Canaria was the best ! On http://www.workaway.info I’ve found a few place where to stay in exchange of some hours of work per week. There were still some fears about quitting my job and dive into the unknown. So I’ve been googling a bit about “Gran Canaria digital nomad” and stumbled up on your your post which really convinced me to dare to do it ! Thanks for that ! Hi Tom, I’m happy this post helped you. How was your stay on Gran Canaria? Are you a full-time nomad now?